The Congress government has fared well in education, electricity and water management, the survey says. 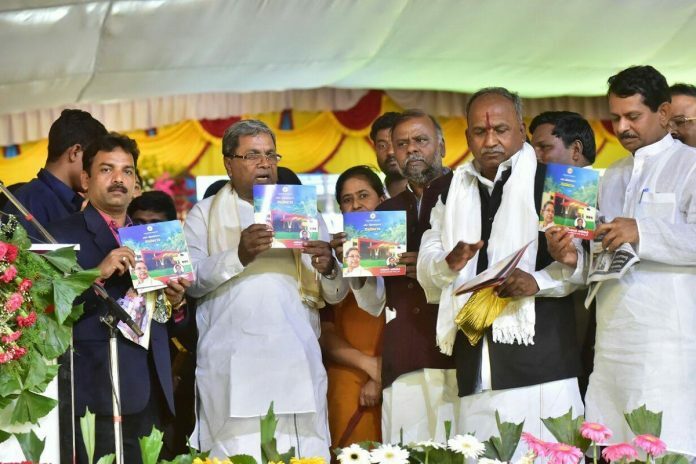 Bengaluru: The people of Karnataka are “quite happy” with the governance of chief minister Siddaramaiah and the ruling Congress has scored seven out of 10 for its performance, a pre-poll survey released Tuesday said. This is the second survey in the Congress-ruled state in a week after the first one, called an “independent survey”, indicated that the party would hold on to the state in the assembly election due on 12 May. It is in the fields of education, electricity and water management that the government has got the thumbs up, according to the latest survey by the Association for Democratic Reforms (ADR) and DAKSH, a civil society organisation. In the urban areas, the Congress scored 7.13 out of 10 while in the rural pockets, it bagged 7.05 out of 10, making the average score of 7.09 on the performance scale. As part of the survey, a total 13,244 voters were interviewed across 224 assembly constituencies in the state between December 2017 and February 2018. The respondents were given parameters such as candidate, political party, caste or religion of the candidate and the party’s chief ministerial face. While 67 per cent of the voters considered the candidate’s caste or religion, 42 per cent made their choices based on the CM candidate. Across rural and urban areas the major issues of concern had been electricity, water supply and food distribution and it is in these areas that the voters felt that the government has done a good job. Siddaramaiah’s welfare schemes, including Anna Bhagya, Krishi Bhagya, Cycle Bhagya and Ksheera Bhagya earned him much praise from respondents. According to the voters, the most important issue on their minds was improving water supply and its quality in the state. In this regard, the voters gave the government an 8.06 out of 10 in rural areas and 8.02 out of 10 in urban areas. The voters were also impressed by the government’s effort to ensure better electricity supply (7.97) and education (7.94) in the state. Despite criticism for potholed roads and bad infrastructure, the voters thought that the government had done much for better roads and environmental protection and gave it a 7.81 and 7.80 out of 10 respectively on these two parameters. In rural areas, the issues that concerned them were better schools, hospitals, roads and public health centres and in those areas the government earned a score between 7 and 8 out of 10. In the urban areas, the issues that least concerned people were anti-terrorism and whether their local MLA was accessible or not. But the urban voters were upset with performance when it came to public facilities (6.79), fighting corruption (6.77) and job training (6.40). – 79 per cent said that they were happy with the Anna Bhagya scheme. -58 per cent were happy with the Krishi Bhagya scheme. -Anila or Gas Bhagya received thumbs up from 64 per cent of voters. – Job training (6.4 in urban; 6.6 in rural). – Corruption eradication (6.77 in urban; 6.67 in rural). – Better employment opportunities (6.67 in rural; 6.87 in urban). – Public facilities such as parks, public toilets and footpath (6.79 in urban areas). I loathe to say that the nation, the South too, are but just a lot of spineless sheep. It STILL hasn’t been enough to get people restless and awake that the BJP is sheer disaster so far as identity-liberty is held. And with that, will come tyranny in financial and personal liberty. The INC in Ktka could EASILY highlight the conditions of MH and Goa, where the BJP administrations act as vassals to the Gangeiite and “Hindi-barking” states. MH has not made a case for fairer tax returns even when MH is the most SEVERELY persecuted when it comes to tax sharing arrangements. Even accounting for the ‘headquarter-effect’, how fair is it for MH to get a mere 15% of their contributions back?!?! Fadnavis is also paving the way for the absolute imposition of Hindi in that state, against people’s wishes. Hindi is taught in the State-board. And now, CBSE makes it compulsory. CBSE is run by the taxes of US ALL, what gives it any right to throw a pointless language at us when we have a common language that is widely used, and will in all certainty continue to be so? The bullet train would now mean MH and Marathi taxpayers, which is everybody as the GST comes in, as we all pay a tax on every good we purchase.. would share 50% costs with Gujarat. The train has 24% of the rail line in MH, and will mostly be used by Mumbaikars of Gujarati origin.. and Marathis should yet foot half the bill?! With a BJP in Ktaka — same old story — veg terrorism, mandatory Hindi and spinelessness when fighting for value for our HARD-EARNED taxes! I can only hope for all its pointlessness, that the Kannadigas see this imminent tyranny coming their way, and steer clear of these pests. We direly need principles-based parties who have a sound economic and moral ideology they adhere to and willing to work and stand for those values. And we all, the North too, need to build those parties. Yes, we, the ordinary people behind the screens! Karnataka govt. Is doing well,public will expect more in future also. According to some observers, 2019 will revert to being an aggregation of state outcomes, more than a wave result. Good CMs will prove invaluable to their parties.